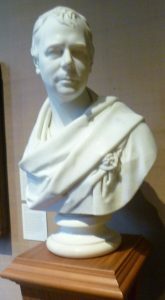 I want to look at what three of Jane Austen’s contemporaries thought of her novels: Sir Walter Scott (1771-1832), the inventor of the historical novel, nick-named the ‘the Wizard of the North’ for his spell-binding stories; Princess Charlotte (1796-1817), daughter of the Prince Regent, who died in childbirth; and Charlotte Brontë (1816-1855), author of Jane Eyre. Miss Brontë was one year old when Jane Austen died. But she has some interesting things to say, so I’ve allowed her to remain. We are indebted to John Lockhart, Scott’s friend and biographer, for an insight into what that best-selling novelist had to say about Jane Austen. 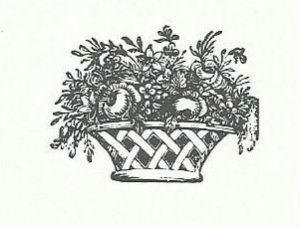 On March 14, 1826, Scott wrote: Also read again, and for the third time at least, Miss Austen’s very finely written novel of ‘Pride and Prejudice’. That young lady had a talent for describing the involvements and feelings and characters of ordinary life, which is to me the most wonderful I ever met with. The Big Bow-wow strain I can do myself like any now going; but the exquisite touch, which renders ordinary commonplace things and characters interesting, from the truth of the description and the sentiment, is denied to me. What a pity such a gifted creature died so early! What did he mean by ‘the Big Bow-wow strain’? The 10th Earl of Pembroke wrote of Dr Samuel Johnson (he of the famous Dictionary), ‘Dr Johnson’s sayings would not appear so extraordinary, were it not for his bow-wow way.’ I also came across another 18th century reference to the ‘bow-wow’ sound of trumpets and drums. So I think we can take it to mean ‘a touch bombastic’. Scott wrote stirring tales of battles and deeds of derring-do, which was not Jane Austen’s style. But it’s good to know that Scott was a real fan and appreciated and admired her qualities. As he wrote in his diary, on 18th September, 1827: Smoked my cigar with Lockhart after dinner, and then whiled away the evening over one of Miss Austen’s novels. There is a truth of painting in her writings which always delights me. They do not, it is true, get above the middle classes of society, but there she is inimitable. 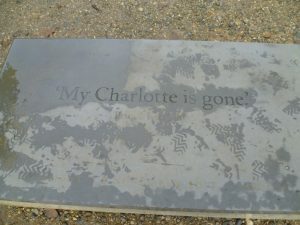 The stone marking the site of Princess Charlotte’s mausoleum: ‘My Charlotte is Gone’, Prince Leopold. It’s easy to sympathize with Charlotte’s identification with the passionate and impulsive seventeen-year-old Marianne, who is just the sort of character to appeal a lonely and romantic-minded girl, whose life, up to that point, had been pretty miserable. Perhaps Charlotte hoped that, like Marianne, she, too, would find love. Alas, her story ended tragically, for she died in childbirth aged only twenty-one. When I think of Elizabeth Bennet’s energetic walk to see her ill sister at Netherfield, ‘crossing field after field at a quick pace, jumping over stiles and spring over puddles, with impatient activity; and finding herself at last within view of the house with weary ankles, dirty stockings, and a face glowing with the warmth of exercise,’ I find myself wondering if we’re talking about the same author. Look at Marianne Dashwood’s reaction on getting Willoughby’s letter repudiating their relationship. ‘Misery such as mine has no pride, I care not who knows that I am wretched. 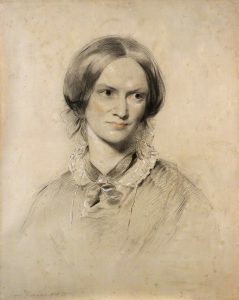 The triumph of seeing me so may be open to all the world… I must feel – must be wretched…’ Surely, Charlotte Brontë cannot interpret such a passionate outpouring as cool and unfeeling. And what about Anne Elliot, in Persuasion; mentally comparing her cousin Mr Elliot with Captain Wentworth? She thinks: ‘Mr Elliot was rational, discreet, polished, – but he was not open. There was never any burst of feeling, any warmth of indignation or delight, at the evil of good of others. To Anne, this was a decided imperfection.’ Charlotte would surely have agreed. I fear that Charlotte was blinded by prejudice. 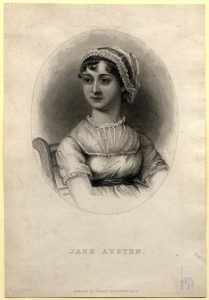 Once she’d decided that Jane Austen’s novels were limited in their emotional range, she refused to look deeper. Austen’s novels might have no mad wife in the attic, as Charlotte does in Jane Eyre, but don’t tell me that Lady Catherine de Bourgh, or the unpleasant Mrs Norris, or General Tilney, weren’t quite as destructive of Elizabeth, Fanny or Catherine’s comfort in their own way. I knew that Princess Charlotte was a fan of Marianne but not that she shared my birthday. Delightful. And so pleased that dear Walter Scott knew himself so well. As for Charlotte Bronte – I fear that Miss Austen would have thought the Parsonage NOT a well-regulated household. Between Patrick, Bramwell and the shadow of death, the Brontes’ own lives seem to have teetered on the edge of melodrama a fair old proportion of the time. Your comment made me laugh, Jenny. You are so right! There’s more than a touch of Cold Comfort Farm about the Bronte parsonage. 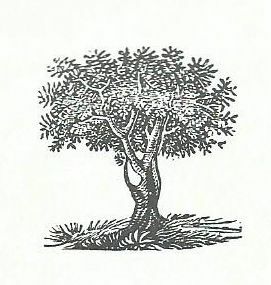 Perhaps Charlotte saw Jane Austen as a threatening Flora Poste-type figure.